9 M images up to 15 fps. VIQS (Variable Image Quality on Specified area) technology allows the designated eight areas to retain higher image quality while the excluded area will have a decreased image quality, which enables to use lower image file size and bit rate. Only for fisheye image. Multiple H.264 (High profile) streams and JPEG streams ensure simultaneous real time monitoring and high resolution recording by new 4K ULTRA HD engine. A fisheye lens control function realizes intelligible screen operation intuitively. Wide dynamic range and ABS (Adaptive Black Stretch) technologies deliver wider dynamic range. Built-in ABF enables automatic focus adjustment for sharp image both in colour and B/W modes. Indoor scene (50 Hz / 60 Hz) : Flicker caused by fluorescent lightning will be automatically compensated. Privacy Zone can mask up to 8 private areas, such as house windows and entrances/exits. Configurable only on the fisheye image. Alarm sources including 3 terminal input, VMD and Panasonic alarm command can trigger actions such as SDXC/ SDHC/SD memory recording, FTP image transfer, E-mail notification, Indication on browser, Alarm terminal output, HTTP notification, and Panasonic protocol output. Prioritized stream control : One of the video streams can be prioritized when multiple recorders or client PCs are accessing the camera so that the recorder or the client PC can maintain the frame rate. Can be added new intelligent extension software (Extension software) in addition to built- in VMD (Video Motion Detection), alarm function. Internet mode : H.264 images can be transmitted over HTTP protocol. 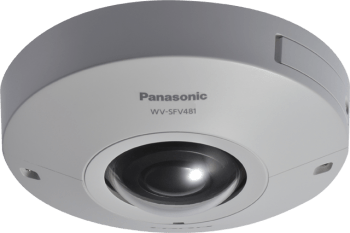 The WV-SFV481 can deliver 9M image up to 15 fps and 4M image up to 30fps. The day/night (IR) function with the digital noise reduction and 3D-DNR allows clear images in low light conditions. ABF (Auto Back Focus) ensures sharp focus in both colour and monochrome modes correcting the focus when temperature swings having a clear focus in any condition. The newly developed Panasonic lens delivers an extremely good image quality on the edges of the image and with the lens distortion compensation the images can be adjusted 256 steps. SD edge recording is available for an easy recording on the camera being able to check through the camera website or from the WV-ASM200 software platform. The WV-SFV481 is equipped with a vandal resistance mechanism for high reliability and comply EN50155 standard for on vehicle applications. Some of the advanced features include Face detection to detect the position of human faces within the image, Variable Image Quality on Specified area to retain higher quality with lower bandwidth and the unique dehumidification device to reduce moisture in various weather conditions. The WV-SFV481 has the option to add intelligent functions like the Heat Map for high traffic zones and long-stay zones, the people counting by up to 12 cross lines and the unique moving object remover, which removes the moving objects of the images providing privacy while keeping the background at the same time. 16 Preset can only be used when the image type is Quad PTZ or Single PTZ. Auto mode can only be used when the image type is Quad PTZ or Single PTZ. Self return can only be used when the image type is Quad PTZ or Single PTZ. * You can specify characters to be displayed on each of the four screens when "Quad streams" is selected. * Alarm and others don't work as the same time. (*) on the right of it is selected, the actual frame rate may be lower that the value selected. * The available range of the H.264 bit rate varies depending on the setting selected for "Image capture size". (the monitor type can be changed by the software). *2 Refer to "Notes on Windows Vista® / Windows® 7 / Windows® 8" on the provided CD-ROM for further information about system requirements for a PC and precautions when using Microsoft® Windows® 8 or Microsoft® Windows® 7 or Microsoft® Windows Vista®. *3 Transmission for 2 streams can be individually set. *4 When recording audio on an SD memory card, only AAC-LC (Advanced Audio Coding - Low Complexity) can be used. *5 In order to be able to switch the monitor output, "9M Fisheye" or "4M Fisheye" must be selected for "Image capture mode". For information about usage limitations, refer to "10.1 Configure the basic settings [Basic]" of the Operating Instructions. *6 Only when installation work is properly performed according to the instructions in this book and appropriate waterproof treatment is performed.